son of Hiram Deats (1810-1887) and Elmira Stevenson (1830-). His father was a very wealthy farmer and bequeathed to his son a fortune. At the age of 16, he joined the American Philatelic Association (name changed permanently since 1908 to American Philatelic Society). Numismatic and Archaeological Society. In 1890, he was a Fellow of the American Numismatic and Archaeological Society. newspaper, on Monday, December 10th, 1804. It was officially incorporated on January 8, 1804 at the City Tavern, Trenton, New Jersey. States, rivaling that of John Kerr Tiffany and that abroad of Lord Crawford, which, in 1952, he donated to the Free Library of Philadelphia. Five Hundred) pieces predominantly postcards in 20, 3-Ring Binders. However, not everything is archived in the 3-Ring Binders. Nor is everything yet catalogued. business correspondence with foreign and domestic dealers. The foreign correspondence consists of 322-pieces from 14 different countries. The bulk and strength of the foreign correspondence is from Great Britain & Ireland and Canada consisting of 245 pieces between them. 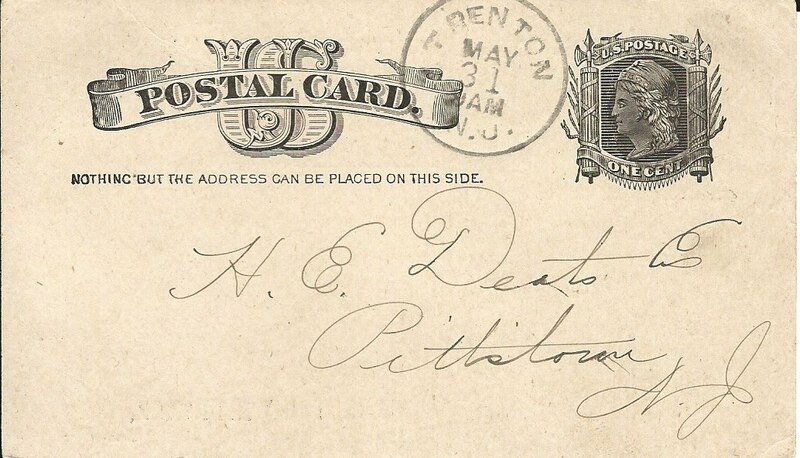 All 814 Pieces of Correspondence by Year + approximately 700 pieces U.S.A.
DEATS, Hiram 1874-02-19 Pittstown Partner firm dissolves: Deats, Case & Co.
CASE, Rhutsen 1874-02-19 Pittstown Partner firm dissolves: DEATS, CASE & Co.
DEATS, Hiram, Jr. 1881-01-27 Pittstown Partner new firm: Deats, Little & Co.
LITTLE, Porter C. 1881-01-27 Pittstown Partner new firm: Deats, Little & Co.
Manufacturing Agricultural implements. Succeeding Lemuel M. Deats & Co., at Pittstown. He was on the Board of Governors ANA and is Charter Member No. 36. He collected colonial New Jersey state coinage copper cents. Proofs and Essays of United States Documentary and Proprietary Revenue Stamps was sold in 1912 by New England Stamp Company. 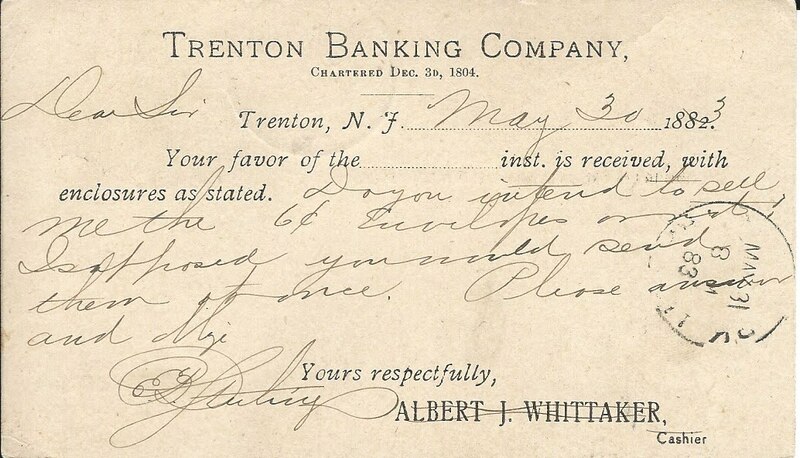 He became partners with Edward Boker Sterling, a stamp collector and dealer living in Trenton, New Jersey. He joined the ANA in 1891 and is member no. 15. He was elected a member of the National Geographic Society on May 4, 1896.
to buy encased postage stamps. Taylor and signed by Amos Smith, Jr. Specimen in the Lupia Numismatic Library - Special Collection - Hiram Edmund Deats Correspondence Archive. casked and bottled spirits or liquor. Specimen in the Lupia Numismatic Library - Special Collection - Hiram Edmund Deats Correspondence Archive. Numismatist, it is announced as June 12-13th. to his death he sold the majority of his library to the Free Library of Philadelphia, He is listed as ANA dues paid in 1897.
years was a trustee of the Peddie School of Hightstown, where he graduated in 1891. In 1912, he was president of the New Jersey Library Association. information of Hunterdon County, and his stamp and coin collection. In 1911 he wrote the introduction to the book by Oliver Scinkel Hart, Some Notes on the New York Postmaster’s Provisional Five Cents, Black, 1845. He served as a member of the Grand Jury, which indicted Bruno Richard Hauptmann in 1934 for the kidnap murder of Charles A. Lindbergh, Jr.
post for more than 50 years with the Flemington National Bank and Trust Company. conserved in the Lupia Numismatic Library, Special Collection, the Chapman Family Correspondence Archive.